Senior Living Apartments Hammonton: When Is a Senior Unsafe Living Alone? When Is a Senior Unsafe Living Alone? Determining when the line has been crossed from making a challenging situation work to maintaining a dangerous lifestyle can be pretty painful. Seniors worried about losing their independence and homes usually don’t want to think about it until something drastic happens, like a fall. Their loved ones will either avoid the subject or push it too hard, creating unnecessary friction in an already-trying situation. At The Heritage, we have a lot of experience with the challenge of figuring out if seniors need assisted living. Though it always comes down to the individual, there are some concrete signs that something needs to change soon. Is there a way to tell for sure that a senior is getting into a dangerous situation living on his or her own? Yes. Like we said, everyone is different, and being careful to listen and observe is always important. However, there are some clear indicators that your senior loved one may be heading for bad quality of life. Read on! Needs medical care that cannot be self-administered. An example is dialysis care. Memory and physical impairments can also make it impossible for the senior to manage basic medical care like pills or shots, and if this happens, professional assistance is definitely needed. Has memory troubles or cognitive impairments that impact his or her ability to remember important details. We’re talking whether the front door got locked or the stove is still on. 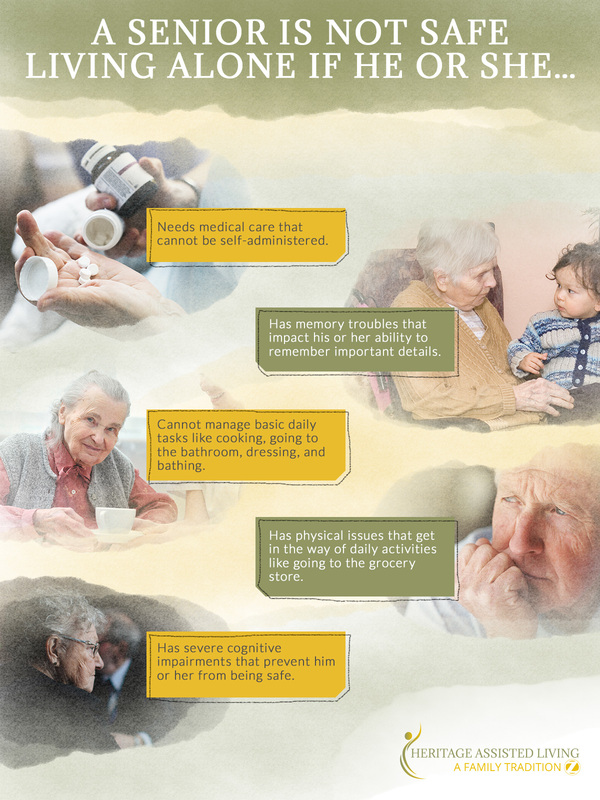 Seniors with these types of impairments will forget to take their medications and put themselves in dangerous situations. They should not be left alone. For whatever reason cannot manage basic daily tasks like cooking, going to the bathroom, moving about, dressing, and bathing. Seniors who cannot manage these tasks will end up living in really bad conditions if they are not given proper assistance. Has physical issues that get in the way of daily activities like going to the grocery store or getting the mail. Seniors like this may be wheelchair-bound or unsteady enough that falling is a constant risk. Has severe cognitive impairments that prevent him or her from being safe. Seniors in this situation will wander into other homes, down the street, and often struggle with confusion and paranoia. Keep in mind that these symptoms should be evaluated by a medical professional or social worker with experience in geriatrics. Don’t just assume your loved one is struggling with one of the above issues; get medical proof. This will likely make conversations about moving into assisted living much easier. The list above is full of difficulties that can be alleviated by a professional team. At The Heritage in Hammonton, we provide both traditional senior living apartments as well as secure dementia facilities. Give your loved one the community, independence, and care he or she deserves. Contact us today!